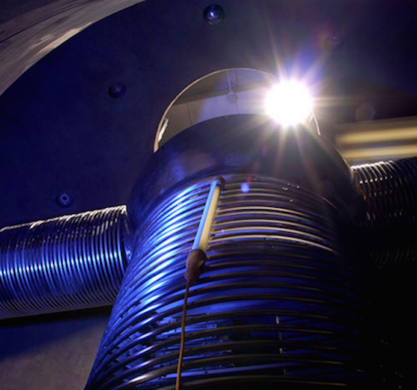 The John E. Edwards Accelerator Laboratory provides ion beams and the associated detection equipment for the study of nuclear reactions of interest for nuclear structure, nuclear astrophysics, materials science, inertial confinement fusion, nuclear energy, homeland security, and other applications. Join us for an Obscura Day tour of the facilities, including a special visit to view the laboratory's tandem Van de Graaff accelerator, which is used to accelerate atomic particles to energies up to 9 MeV (14% of the speed of light) via a large dome charged to high voltage by a moving chain. Cost: FREE, but capacity is limited - please remember to RSVP! The Edwards Accelerator Laboratory is located on the College Green and is building 82 on the campus map. Visitors should enter the building from the south side (ground floor). Attendees under the age of 18 must be accompanied by a parent or guardian.